Freezing cold again this morning but I found my new hot water bottle and Collis filled it so I could at least warm my poor old hands- they just wouldn't work and I had trouble packing the car. Phone call from Annie early questioning if she had taken the correct turn (she wasn't supposed to turn until we were nearly in at Geraldton). I wasn't too sure where she was so found Collis and he put her in the right direction. The road she had taken would add another 40 km onto the day for her. She had cycled about 8 kms down the road before she had turned around. Woody was the last to leave again this morning (all rugged up) but once Annie turned around, she was coming up the rear. Morning tea was at the foreshore in Geraldton where we were picking Chris up after her night in town to get her stitches out. She was waiting for us when we got there without her crutches or her boot- she looked different as we had got so used to her aids. 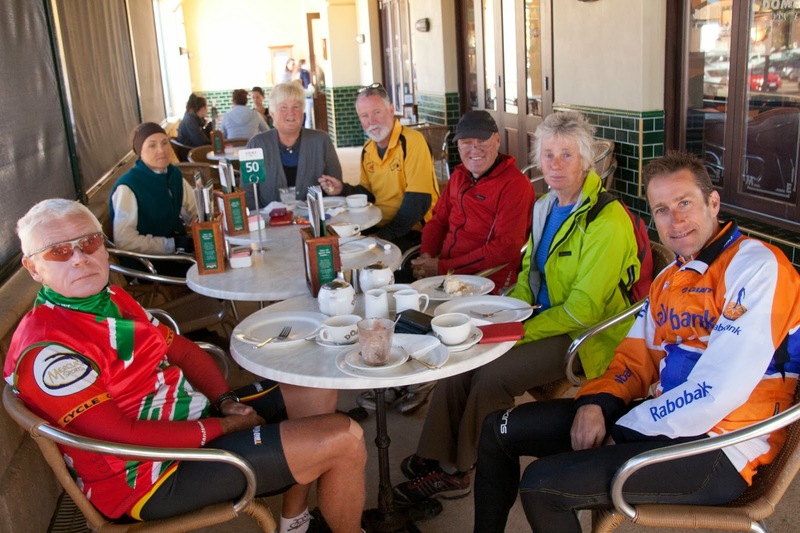 Then Chris surprised everyone by taking us all out for morning tea at the Dome cafe with everyone getting a cake and drink. This was Chris saying thank you to the group for all the assistance she had received in her time of need. Chris is a very independent person and it was very difficult for her to accept assistance and she did as much as she could for herself. She has been an inspiration to all of us with her quiet acceptance of the situation and keeping a smile on her face even when she felt miserable inside. Only a week or so and she will be able to ride again. Morning tea was so good that none of us needed very much lunch today. Lots of canola growing along the road and another crop with a white flower which we haven't found out what it is yet. Lots of green wheat around also. The trees are all leaning in the one direction so the wind must blow pretty hard off the ocean. The road today was pretty slow and the wind was mainly across them. The riding was good up till morning tea but then it got difficult but on the final turn it improved again. Everyone was in by early afternoon again and it was lovely walking along the beach at the back of the park. Collis went down to the pub to watch the footy and Georg and Peter eventually joined him. A lot of teasing about Collis barracking for a girl's team (as stated by a little kid the night before). I wasn't game to go out for dinner tonight after the 2 disastrous meals over the last couple of nights so we cooked in. I threw together a curry with leftover boiled eggs, tomatoes, lentils and chilli. Sounds horrible but it was really yum. We had been donated some food by a camper at our last bush camp so I divvied it up between Ben & Theo who were able to put together a meal for themselves. Then Collis topped it all off with an apricot pie he had been carrying since Kalbarri. Nice hot shower, filled the hottie and climbed early into bed.